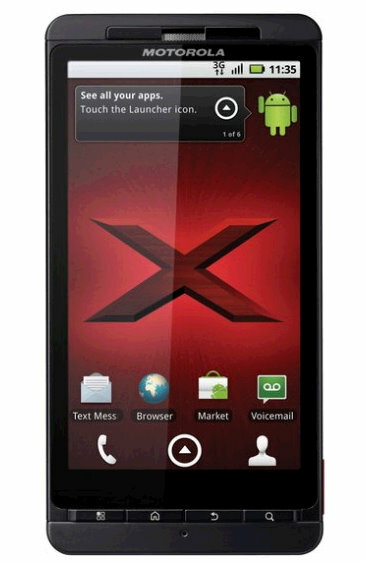 The Motorola Droid X has been one of the best selling Android smartphones in the US since Android was released. Verizon has dominated the Android smartphone market as a result of the Motorola Droid X and the Droid 2. The Motorola Droid X is now set to be released in Mexico as the Motoroi X sometime before the end of 2010. The Motoroi X will be the first Android 2.2 smartphone released in Mexico, and is expected to receive the Android Froyo update sometime this month. IUSACELL will be carrying the Motoroi X and is the third largest cell phone provider in Mexico. No pricing information is available yet. MEXICO CITY, Mexico – November 9, 2010 – Motorola Mobility, a subsidiary of Motorola, Inc. (NYSE: MOT), and Iusacell today introduced the Motorola X MOTOROI. MOTOROI X offers a better experience thanks to its ultra-fast Web browsing, 1GHz processor speed, the functionality of becoming a 3G HotSpot, excellent memory and social messaging intuitive abilities. The device is also compatible with Adobe® Flash® Player 10.1 and gives access to Android Market ™ with more than 100 000 applications, in addition to Ubicacel Copilot. MOTOROI X has a high resolution display of 4.3 inches which allows the user to view the latest video. The video features X MOTOROI enable customers capture their best moments instantly, thanks to its combination of 8-megapixel camera with dual flash, HD camcorder and HDMI and DLNA connectivity to download, transmit and share high-definition personal content.MOTOROI X comes powered with Android 2.2 and Adobe Flash Player 10.1, an application that will allow mobile users to experience hundreds of sites with rich content and applications directly from your browser. Additionally, it has the social networking service MOTOBLUR, Motorola’s unique in its version 1.5. MOTOBLUR, social networking contacts synchronized with the directory, and personal and work email also allows for optimal security to retrieve information or delete with a simple remote command. Corporate users are able to enjoy the feature push e-mail and widgets capable of conveying messages to the home screen, widgets filtering for the differentiation of work and personal email, corporate directory and search Global together with a unified calendar enterprise-level synchronization with Google Calendar ™. In addition, security protocols allow remote control and elimination password via Exchange Server. Motorola MOTOROI X Iusacell will be available from the last quarter of 2010. X has the capacity MOTOROI 3G Mobile Hotspot that turns your phone into a wireless modem to connect up to a total of five devices via Wi-Fi.